Romania celebrates its 17-15 win over Canada. It was like watching a semi bearing down on you on one of England’s one-laned, unnamed roads. Like watching a big tub of lard coming down the airplane aisle, hoping he doesn’t take the seat next to you. But in this case I knew he would, his muffin top spilled onto me as he sank into the creaking seat. Worse yet he had an iPad to shoot photos. Maybe the worst thing ever to have a camera lens attached to it. It’s like shooting pictures with a sheet of plywood. No big deal, right? He snaps a couple shots and the blackboard comes down, right? Wrong. He’s shooting video and its like being at the drive-in, the screen held out there for all of us to see what a shakey, worthless waste of space on his memory chip it is. Only thing that would have been worse is if he put it on a selfie stick. 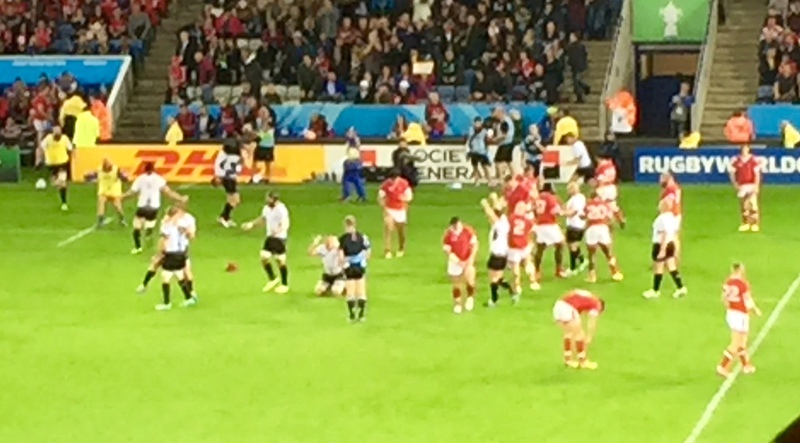 Meanwhile on the field, Canada let the game slip away 17-15 as the Romanian forwards took over, pushing in two tries. The Canucks kicked away too much possession and stopped going to their backs — their strong point in the first half. Posted on October 6, 2015 October 6, 2015 by jbsaulPosted in RugbyTagged Canada, Leicester, Romania, Rugby World Cup, RWC.